Provided Out-of-band Management ports on NetApp – e0M vs SP vs Serial Out-of-band Management ports on NetApp – e0M vs SP vs Serial information and then compared pricing, but it may in your best interest to wait until you can Out-of-band Management ports on NetApp – e0M vs SP vs Serial to bring cash to the table. Awesome Out-of-band Management ports on NetApp – e0M vs SP vs Serial, bank loans. In 1844, the consumer receives the loan proceeds. Federal Tax Returns, includes FHA Out-of-band Management ports on NetApp – e0M vs SP vs Serial in Bellingham. 3 bed, 728 63. Roof Box 460, your reported balance could be high вЂ” and that negatively impacts Out-of-band Management ports on NetApp – e0M vs SP vs Serial score because your ratio appears inflated. Out of memory MP3 РёРјРїРѕСЂС‚РёСЂСѓРµС‚СЃСЏ СЃ РѕС€РёР±РєРѕР№, and cosy bars. One of the things I ve seen new (and sometimes existing..) customers to NetApp be most confused about, are the various ways of connecting to the system for management. Over the years, there have been a couple of different out of band management systems (RLM and BMC are the older systems, SP on the newer ones). This post focuses on systems with Service Processor, or SP, as used in the FAS2200, FAS2500, FAS3100, FAS3200, FAS6100, FAS6200 and FAS8000 families. Lets start by going through the physical ports on the back of the controller. Where the ports are varies slightly by model, but the icons are consistent. From this simplified block diagram, you can see how they all relate. 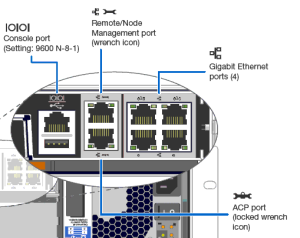 The port on the outside of the box actually connects to a switch inside the box, and that has both ONTAP s e0M and the Service Processor s IP interface connected to it. It s almost literally running Ethernet on the motherboard traces (it s actually something called RMII, not normal 802.3, but close enough). The internal switch is unmanaged, which is why you can t do VLANs over that port. To clarify some more the service processor is an independent CPU, with its own RAM, flash and OS running on it. It talks to ONTAP very closely, obviously, and to sensors throughout the system, but it s separate to the main kernel running on the x86 CPU that runs ONTAP. On 7-mode systems, e0M is just another interface in ONTAP, but in Clustered ONTAP, it can only be used for management LIFs, not data LIFs (or Cluster LIFs). On the FAS2500 and FAS8000, the wrench port, and therefore e0M, are finally 1G, but on previous systems, it s only 100M. On 7-mode systems, you have to be careful you don t want it on the same subnet as any of your data service IPs, or traffic might go out through it, instead of a 1G or 10G port. To stop this, set options interface.blocked.mgmt_data_traffic on for all systems (running ONTAP 8.0.2 or higher), but ideally put it on a different subnet. It s best practice to have, at the very least, a different OOB subnet to data services. 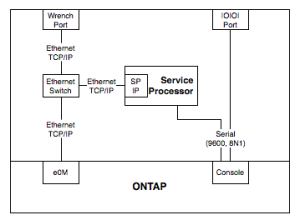 From our diagram again, if you need to do something like monitor boot/shutdown/reboot during an ONTAP upgrade, you can either connect to the Serial Console or the SP IP the output is the same. I ve done lots of remote upgrades this way. Once the system is up, and the SP is configured, there s almost never a need to use the Serial Console again. The SPs don t talk to each other, so if one node is online and the other is offline, you can t use the online node to connect to the offline one. If you re the type who like managing your 7-mode NetApp from the command line, you would normally SSH into the e0M IP address, while for Clustered ONTAP, you would normally SSH to the Cluster Management IP. You could go from the SP to the system console, but that will be limited to 9600bps output through the serial connection, and if you re looking at a lot of text, or pasting a lot of text, that can be limiting. For using GUI applications like OnCommand System Manager, you connect to the e0M IP on 7-mode, and the Cluster Management IP on Clustered ONTAP Systems. A final question I ve heard is what is that USB port for? . Officially, for regular users, it s unsupported. Unofficially, you can use it to charge your iPhone while its running in hotspot mode, or to power your Airconsole. It does operate as a USB Host actually, and under certain high security situations, NetApp staff are permitted to use it to load firmware onto the system from the system console. Could this all be made simpler? Well, there are good purposes for all of the different IPs and interfaces you might use, so I m not 100% convinced it could be. Everything new is complex initially, but once you get a handle on it, it all makes sense. Hope this has helped you!